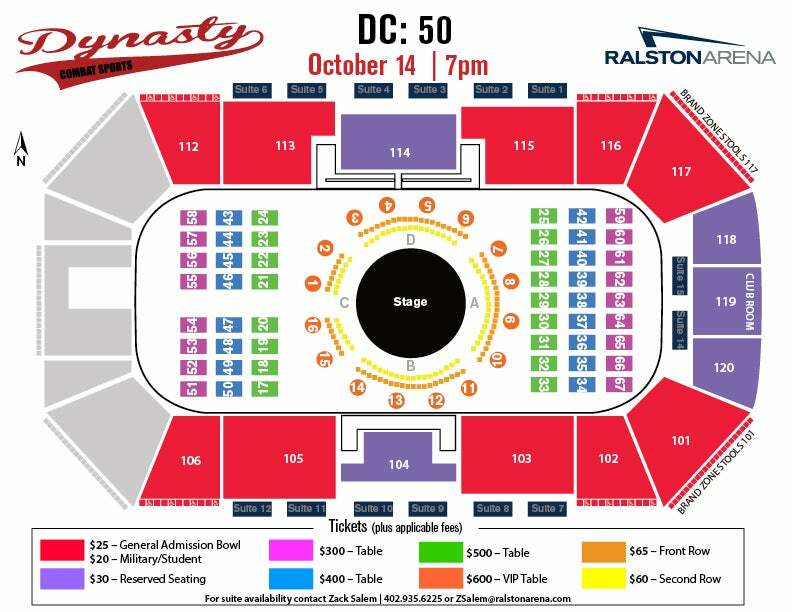 Dynasty Sports Combat Brings Its 50th Event to Ralston Arena. 16 Action Packed Fights, 1 Cage. After a successful debut at Ralston Arena in June, Dynasty Combat Sports will return with Live MMA, October 14th at the Ralston Arena. It will mark DC's 50th event and it is a special one with 16 action packed matches. The main event will Feature one of Nebraska's most popular fighter's, Alonzo Martinez, a Bellator, Strikeforce, RFA, and VFC veteran with almost 60 pro fights. Coming out of Premier Combat Center Martinez will face Mick Doyle's product, Boimah Karmo. Karmo went undefeated as an amateur and now 2-0 as a pro. Another veteran versus a top prospect match up, Matt Delanoit, nearly a 40 fight Pro veteran. Competing for over a decade will fight at heavyweight. This will be his 5th different weight class versus timeless veteran Scott Hough. Hough has also been competing for over a decade and recently coming off a win at the last DC Ralston Arena Event. Matt Williams and TJ Benson will return to the DC Steel in what could easily be the fight of the night. Fan favorite Sean Wilson, who has several fights dating back about 15 years will face off versus Lincoln's own, Tate Wright, in a Striker vs Jui Jitsu battle. Fremont Fire Fighter, Brian Monaghan, tries to continue his recent win streak against Bellator veteran, Matt Foster. Valley's Ryan Braun makes a highly anticipated return versus Dual Combat Sport Athlete Mike Seymour, Wahoo's Corey Davis will make his pro debut versus Illinois product Wes Powers, and Omaha Nebraska's own Jozette Cotton will face Canada's own Bobbi-Jo Dalziel after a year and a half lay off in a WMMA battle of the undefeateds. The amateur car will feature our Middleweight title holder Wayne Sullivan in his first title defense, Doane Wrestling product Hawaii's Kevin Corbet, and many others.